Marketing teams need more support from adtech vendors to optimize campaigns, and as the adtech landscape grows, vendors will need to differentiate themselves through their superior technology and top-notch consulting. More than half of marketers are currently using advertising technology, according to a new study from Walker Sands Communications, an integrated PR and digital marketing agency for B2B technology and professional services companies. 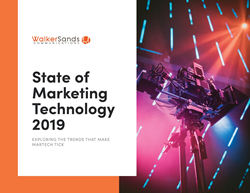 In “State of Marketing Technology 2019: Exploring the Trends That Make Martech Tick”, Walker Sands surveyed 316 marketing, sales and advertising professionals and found that 42% of respondents value adtech in their day-to-day operations. Furthermore, 29% of respondents want their company to invest more in adtech. The study revealed that 75% of respondents agree that their company is investing in the right amount of martech, creating additional opportunities for adtech investments as organizations find their footing with their martech stacks. Almost 8 out of 10 (77%) of all respondents report using programmatic advertising to gain objective value from their ad placements. And over half (58%) who use programmatic advertising saw ROI from it. To download the full State of Marketing Technology 2019: Exploring the Trends That Make Martech Tick report, click here.